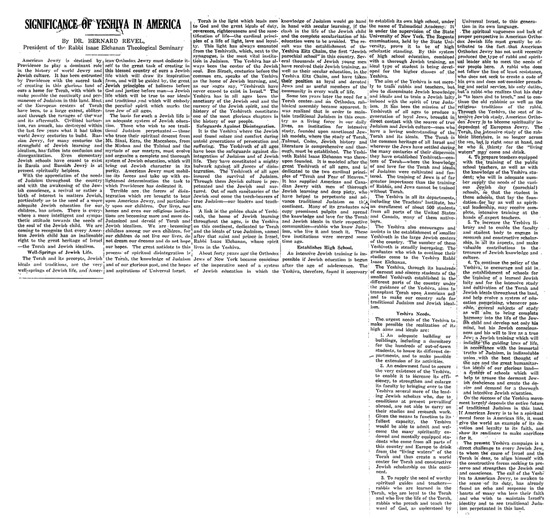 Revel on the "Signifigance of [a] Yeshiva in America"
In early 1924 Rabbi Dr. Bernard Revel published a piece called Signifigance of Yeshiva in America, meant to appear, I am sure, in as many media sources as would print it. 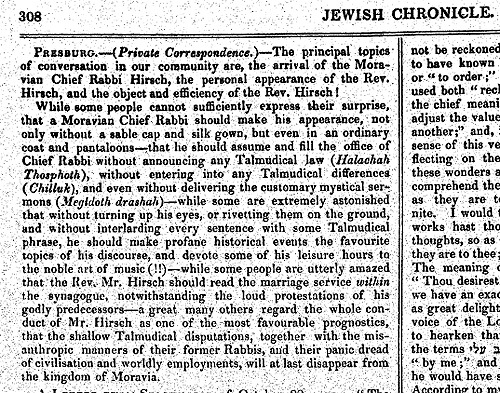 Here is the article as printed in Newark's Jewish Chronicle, February 8, 1924. Here's the story of a Dutch Jew named Levi and his cousin, a Jewish servant girl named Katrina, who converted to Christianity in or around 1799. Katrina worked for "respectable" Sephardim. Look at Levi's brother's problem with kashrut. 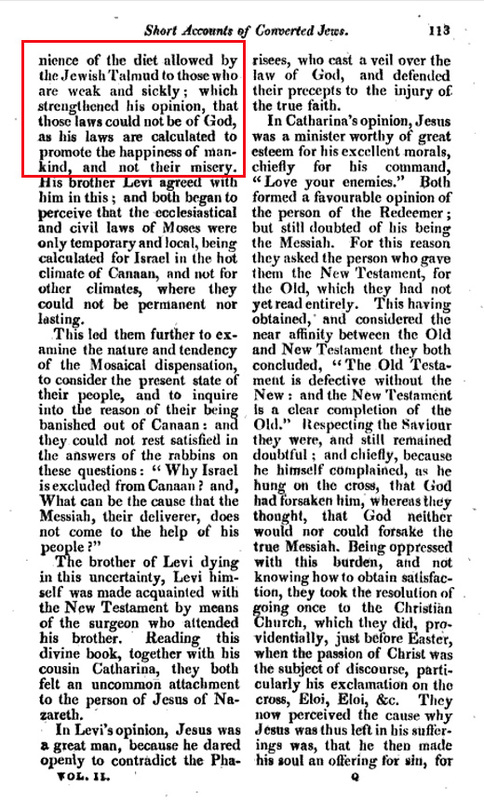 From the 1817 issue of The Jewish Expositor, and Friend of Israel. Have you seen that Jewess? Here's a rather interesting 'missed connection' type of ad from 1869 in the New York Herald. 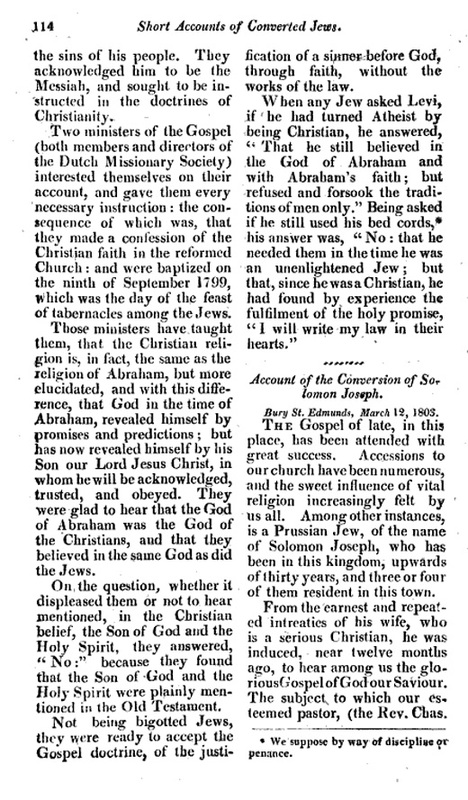 Jewish Chronicle Nov. 12, 1847. Can a man divorce his wife for wearing a sheitel cut in a flapper's style? From 1927. 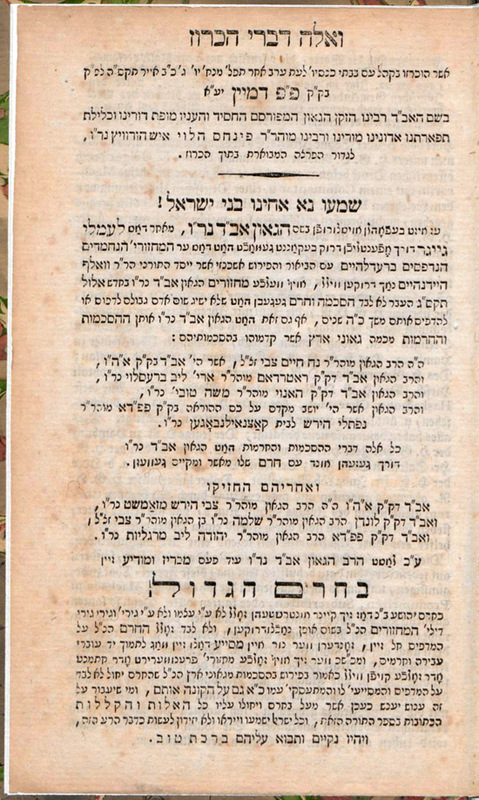 This little piece, which is from the Jewish Chronicle via the JTA newswire, states that a man in Warsaw tried to divorce his wife on grounds that she did not dress tznius. She wore a sheitel, but it was cut in a 'boyish bob.' And her sleeves were too short. No dice, ruled the rabbi. 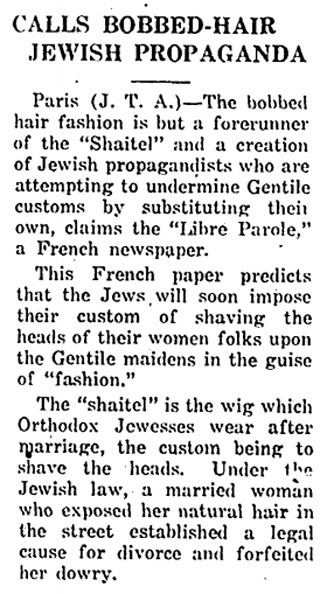 And in the tarte de-sasrei department, here is another JTA piece from 1924, recounting how an antisemitic French newspaper declared that the new fashion of the Flapper's bob is a Jewish conspiracy modeled on the sheitel and that head-shaving for gentile women was no doubt soon in store. I guess the aforementioned rav agreed with the Libre Parole. 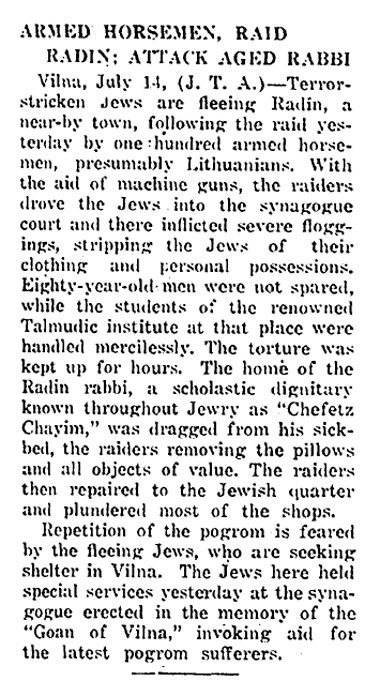 This is Newark's Jewish Chronicle's account of a pogrom in Radin in 1922, and how it personally affected the Chofetz Chaim, who was dragged outside from his sickbed, and his pillows stolen by marauders. 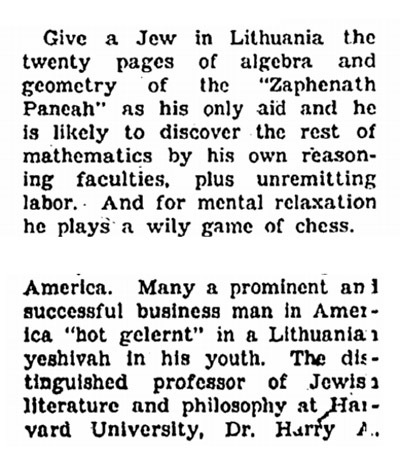 Here's a couple of interesting excerpts from the Jewish Chronicle - of Newark, New Jersey - from Nov. 16, 1928. The article was called "Lithuanian Jews Have Rich Culture As Their Heritage." 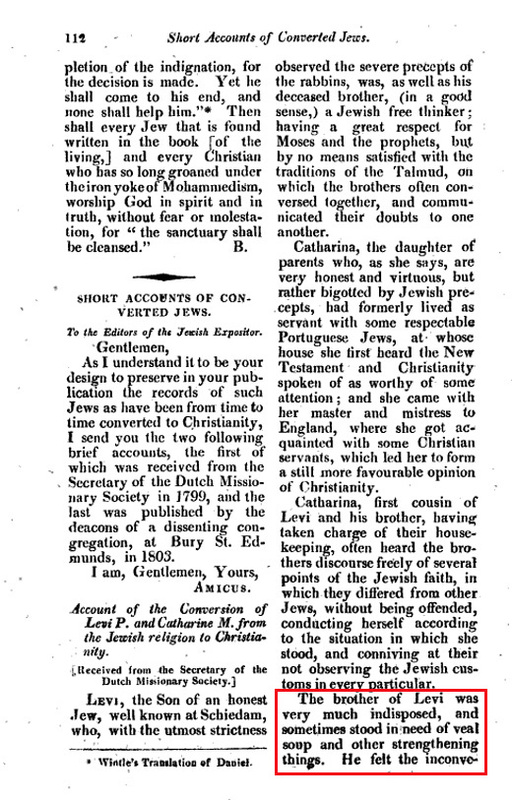 It also points out that "Lithuania, it is important to remember, is the only country in Europe where that are no assimilationists, so that it is no wonder that Zionism should have a stronghold there. . . . Today, despite enormous economic handicaps, Lithuanian Jewry retains its intellectual morale. It is the only country in the world where 95 per cent of the Jewish children are educated in Jewish schools, where they receive not only a Jewish but a general education as well." It also points out that 800 boys and girls study in Kovno University. 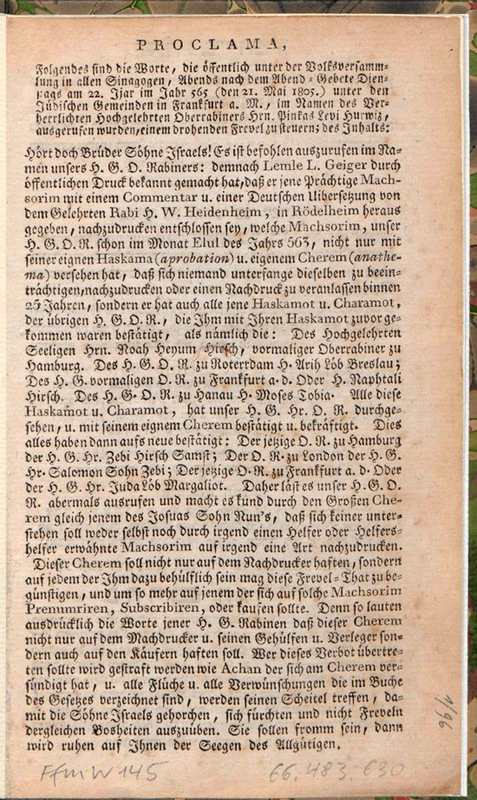 For more - or actually, less - on this fascinating episode, see p. 133 in Monatsschrift für Geschichte und Wissenschaft des Judentums, Volume 44, in 'Materialen zu einer Biographie Wolf Heidenheims' by Louis Lewin (the rabbi, not the expert on peyote).